Infant - $26.99 Only 7 left! Who's ready to kick some shell?? We know the Teenage Mutant Ninja Turtles are, and with their big brother Leonardo leading the way, these turtles always come out on top! Now you can dress your little guy up in this officially licensed Toddler TMNT Leonardo Costume, so he'll look just like the fearless leader from the hit cartoon series on Nickelodeon! Leo may not be the funniest turtle in the gang, or the cleverest, or the fiercest fighter. But, he's got something that the other turtles don't which makes him a natural leader: patience. Leo is definitely the most patient one in the group, which helps him keep his younger brothers focused and in line, even when they'd rather be playing video games or scarfing down pizzas. But just because he's the leader doesn't mean he's always serious! He still loves to party with the other turtles and train with Master Splinter when there isn't a mission to perform. Although, he's always worried about his brothers being prepared for action, since he wants them to be the best ninja team they can possibly be! 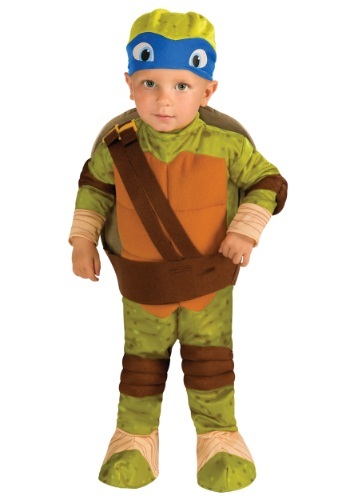 Your little buddy will look just like the real leader of the Turtles in this costume. (except, much more adorable than the actual Leo!) The soft jumpsuit is printed to look like green spotty amphibian skin, and features built in matching shoe covers, and knee and elbow pads. The plush turtle shell and green cap give him the complete TMNT look, so your little crime fighter will be ready jump right into action. Turtle Power!